When it comes to making that critical decision of which taxidermist will do the taxidermy artwork on you trophy. Think about how much you have invested into your hunting and fishing in terms of time, money and effort. Although very important, price should not be the only factor when making your decision. 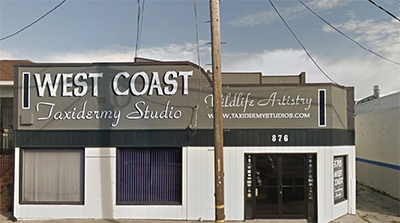 At West Coast Taxidermy Studio, we are noted for using only the finest state-of-the-art materials and applauded for our artistic attention to detail. By allowing us to give you the best value for your dollar, the final result will be much more than a mount: you will have an original piece of wildlife art to enjoy forever! Our combination of over twenty years of experience and modern methods will ensure you a realistic looking trophy that will be appreciated for many years to come. We are conveniently located near Highway 101 and the San Francisco Airport. We invite you to stop by our showroom and experience our revolving display of mounts and trophies. Whether it’s your first trophy, or one of many, I am sure you will be pleased with what West Coast Taxidermy Studio has to offer.